Matilda Theatre Breaks will have young and old rolling in the aisles with laughter from start to finish. 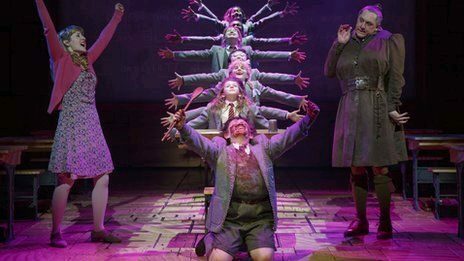 With 7 Olivier Awards tucked under it’s belt, Matilda The Musical is a hilarious and terrifically staged production. Its instantly memorable music and witty lyrics are written by Australian comedian Tim Minchin. Children and adults on our Matilda Theatre Breaks will be thrilled and delighted by the story of the special little girl with an extraordinary imagination. The excellent 4 star deluxe Radisson Blu Mercer Street Hotel is directly opposite the theatre. Also there’s the 4 star deluxe Kingsway Hall nearby to the east of Covent Garden. If you are on a budget, a great deal can be had at the 3 star St Giles near Oxford Street. The central Travelodge Covent Garden is also a good choice. Also look at hotels in Bayswater or Kensington. You can get to both areas easily by tube or bus and the hotels are even cheaper. If you are coming down to London “mob-handed” then stay at the Holiday Inn Kings Cross Bloomsbury for the perfect base for Matilda Theatre breaks. A lovely big modern hotel with great facilities (inc. indoor swimming pool) is has also rooms for families of up to 4 people (2 adults and 2 children under 16). I was fortunate to see the original Matilda twice. Once in Stratford-upon-Avon with a group of adults (all of whom enjoyed the show) and then later on with my two boys. They were aged 9 and 11yrs at the time. Both shows were faultless, but seeing my children enjoy it so much edged the second viewing into top spot. We have since seen it in London too. Still just as entertaining as the first time around. I loved Matilda. The girl playing her was fantastic and all the characters just like I imagined reading the book. I especially liked Bruce when he was eating the cake. My favourite line is "don't let a little thing like 'little' stop you!" I want to see it again. Well, what a brilliant time we had last night at Matilda the Musical. We had much better seats than we did in Stratford and it made all the difference. The children loved, I loved it, the audience loved it. Standing ovation for Kerry Ingram who played Matilda and another standing ovation for whole cast. All came out happy and smiley. Can't say enough good things about this show. It really is the one to watch this year and now on until October 2012. I agree – it’s brilliant. Can’t wait to see it again when it comes to London.